The SFI can be adapted for use as a Silo Intake Separator and is also compatible with an Aspirator unit or with a Hopper at the stock outlet. Stock enters the Separator and is evenly distributed across the width of the upper sieve. 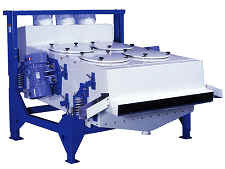 The reciprocating movement caused by the vibratory motors, moves the stock downwards across the screen surface and at the same time effectively directs the grain into a vertical position to pass through the perforated screens. The Satake SFI has been designed to ensure that the stock moves more slowly down the sieve towards the outlet/tail end than at the inlet/head end. This results in overtailing stock lingering on the sieve, improving stock distribution and increasing sieve capacity. 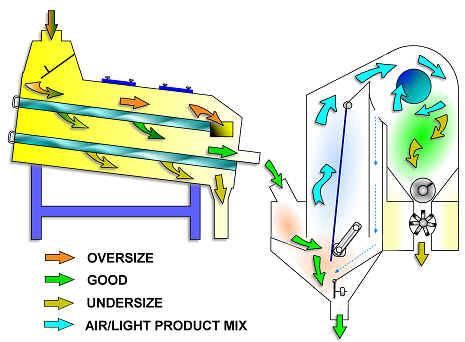 Grain proceeds through the sieves and out into either an aspirator or hopper. Large, extraneous material is removed on each side of the machine while finer materials are directed to an outlet underneath. To simplify machine set-up, a tube is fitted centrally across the sieve body to support vibratory motors attached to each side of the machine. The tube contains the internal forces between the motors. Simple, angular adjustment of the tube/motor assembly gives a precise and even control of the sieve body motion.